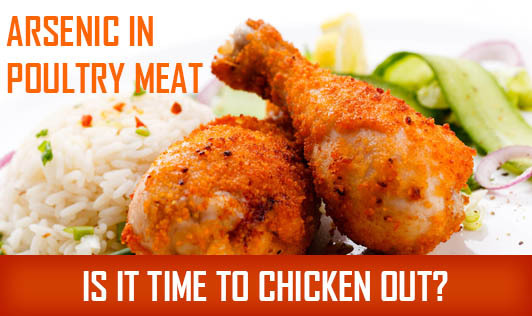 Arsenic in Poultry Meat: Is it time to Chicken Out? Controversy isn’t new when it comes to packaged foods these days. First, there was the ‘Maggi’ ban in India, and now the FDA (Food and Drug Administration) has admitted that 70% of chickens sold in the USA contain arsenic! Arsenic rings synonymous with poison and is commonly used in rat poison, weed killers, and in manufacturing glass. It found its way into chicken meat through the feed additive Roxarsone (arsenic-based animal drug as termed by the FDA), the poultry industry uses to promote growth, increase weight, kill stomach parasites, and simultaneously improve the color of chicken meat. A recent study conducted by the FDA on 100 broilers revealed the presence of inorganic arsenic present in higher quantities in the liver of chickens treated to feed containing 3-Nitro, another common name for Roxarsone. Inorganic arsenic is far more dangerous than organic arsenic, which naturally occurs in the livers of chicken that have not been fed Roxarsone. In fact, arsenic is an environmental hazard that extends far beyond poultry. Not only does it end up in chicken meat, it is also present in chicken excreta- around 150 mg. Thousands of tons of chicken litter are converted into fertilizers that are used in fields and gardens. This leads to ground water contamination as well. Opt for free-range organic chicken. Avoid meat that looks exceptionally plump and/or bright pink in color. Check that the fat on the chicken is between white to dark yellow, and not gray. Large amounts of arsenic can cause immediate death. And while the FDA has ensured that the amounts present in chicken are too tiny to cause any real danger, even small amounts of the chemical, over a period of time, can lead to cancer of the bladder, lung, kidney, and colon, affect the immune system, cause damage to the neurological and endocrine systems, and lead to decline in brain function.